As free settlers commenced to arrive in Brisbane, there was a requirement for building materials. 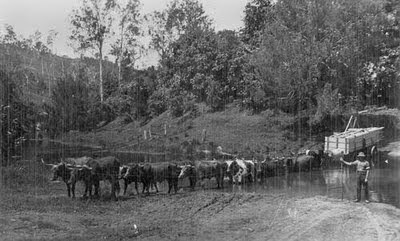 The Gold Coast hinterland proved to be a rich source of much needed timber. One of the early timber families in the area was the Lahey family, who constructed a sawmill at Canungra in 1884. The Laheys built up considerable land holdings nearby, and carted the trees felled on their properties to the sawmill by bullock team. Sawn timber was also hauled to the rail head in the same fashion. The following photo shows dressed timber being carted across Bennoble crossing to the railway. It dates from 1916. As the timber near the sawmill was harvested, trees had to be cut further afield. This meant that fetching the logs to the mill involved longer distances and greater travelling time. The Lahey family's solution to this problem was mechanisation, and they set about constructing a private tramway to the mill. In 1900 they commissioned a detailed engineering survey that was performed by George Phillips. The tramway needed a powerful locomotive to handle the steep grades and heavy loads, and this is the one they used. It is a Climax geared locomotive that was ordered from the United States in 1900, and arrived in 1903. It is photographed below in 1905, being used on this occasion for a picnic excursion. 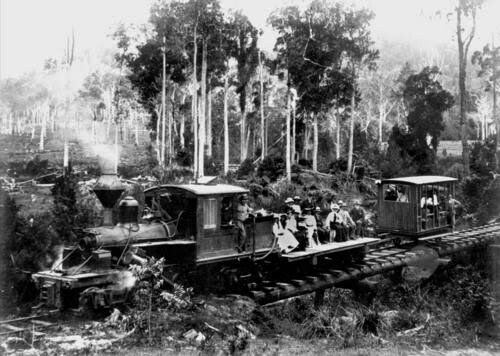 One of the engineering problems encountered for the construction of the tramway was traversing the Darlington Range to reach the mill in Canungra. The solution was to drill a tunnel through the sandstone mountain. The construction of the tramway was performed by a Mr Clark, who was able to cut through the sandstone, although it took a couple of years. 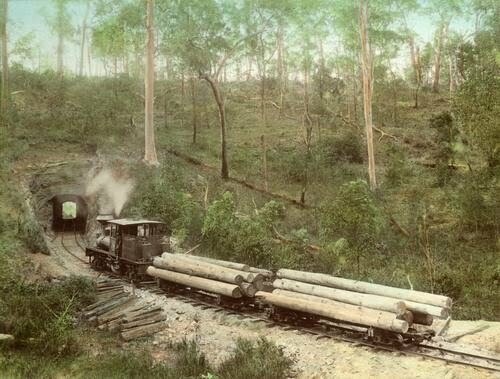 The tunnel was in use by 1903 and here is a photograph of the locomotive approaching it with a full load of fresh lumber. This image is from 1912. Because the tunnel was cut through tough sandstone, there was no requirement for lining or support. The tunnel was some 91 metres in length, and is straight - hence each end of the tunnel is readily seen from the other. The total track laid for the tramway over its active life was more than 26 km. By the 1920s, the timber in the area was mostly exhausted, and the tramway was only used occasionally. The line was dismantled around 1933 and the bogeys and other equipment were sold by 1935. During WWII the tunnel was used to store explosives from the nearby Kokoda Barracks at Canungra. In 2001 the tunnel was reopened for pedestrian and tourist activity following a government grant. Recent heavy rain has temporarily caused closure of the tunnel because of land slippage in the area, but this is the way it looks now. Really interesting! I often wondered about the history of that tunnel. I've been there a few times with friends but never had the courage to walk all the way through. Charlotte: I know what you mean. I was there a couple of different days and it was closed. I think that I wasn't altogether unhappy about that! !